Do Paper Links Exist in Evolution? Just How Well Does Darwin’s Theory Hold Up? How Can Cross-breeding Be Possible? Imagine for a moment that you are stranded part way down a cliff on a small ledge. It is impossible to climb up and to go down would mean certain death. A person comes along and, spotting you, lowers a steel chain just long enough to reach you. As you grab the welcome aid, you look up and notice that halfway up the chain is one link made of paper. More than 99% of the links are strong so 1% can’t matter, can it? For over two years, these articles have examined various pieces of evidence for the handiwork of a Creator in nature. The only alternative to this idea is evolution. Either life evolved by random accidents or it was designed and created. Therefore, if evolution doesn’t work, intellgient design is the only alternative. Creationists can explain the unknown easily: God did it that way. Evolutionists must explain everything for natural processes demand an explanation. The question is, do paper links exist in the explanation of the chain of events that supposedly evolved life as we know it? I maintain there are at least ten and we will be outlining these in the next three articles. Note that Darwin himself recognized the first four and said if they can’t be explained, his whole theory would collapse. One hundred and fifty years have passed since he presented his godless ideas. Have satisfactory explanations followed? 1) Transitional forms must be found in the fossil record. If life changed gradually from one form to other, then part-way forms must have existed. This is the so-called missing link. However, no such transitional forms have been found. Indeed, we don’t have one mission link but thousands of missing links in connecting life in one continuous chain. What about amphibians? Aren’t they half fish and half air breather? No, they continue to reproduce the same species century after century. They are not gradually changing into only air breathers. Neither does adaptation explain evolution for an adapting species does not change into another species. Desperate attempts have been made to create human transition forms from bone fragments, such as Nebraska man and Piltdown man but these have eventually met with embarrassment. After 150 years of searching, the shocking absence of transitional forms demands an explanation. 2) The incredible complexity of organs like the eye. Someone suggested to Darwin that perhaps the eye evolved through three separate branches of the evolutionary tree. He replied, “I have enough trouble explaining how the eye could evolve at all.” After 150 years, far from explaining it, we marvel more than ever at the eye’s complexity. How many random accidents would be needed to produce it? The eye was Darwin’s example but with the advancements of science, we now know that every part of the human body is amazingly complex. This is true of all of life. Even bacteria perform complex chemical reactions to accomplish specific goals. 3) Instincts in animals. How can knowledge be acquired and then passed on to offspring without instruction? For example, how does the Magnolia Warbler know how to navigate by the stars? 4) Sterility of cross-breeding in animals. 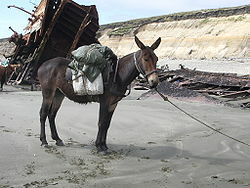 One example is the mule, the offspring of a male donkey and a female horse. (The offspring of a male horse and a female donkey is called a hinny but are much rarer.) “Mules and hinnies are almost always sterile. The sterility is attributed to the differing number of chromosomes of the two species: donkeys have 62 chromosomes, whereas horses have 64.” (Wiki) If cross-breeding of similar species almost always produces sterile offspring, how can we explain the vast differences between all the animals and man?